German research vessel Sonne and a Wave Glider unmanned surface vessel (USV) were used to harvest data from AMTs. USVs can now also perform GPS-Acoustic measurements. Ioil recovery (IOR) programs at existing ? elds rather than and mud slips. 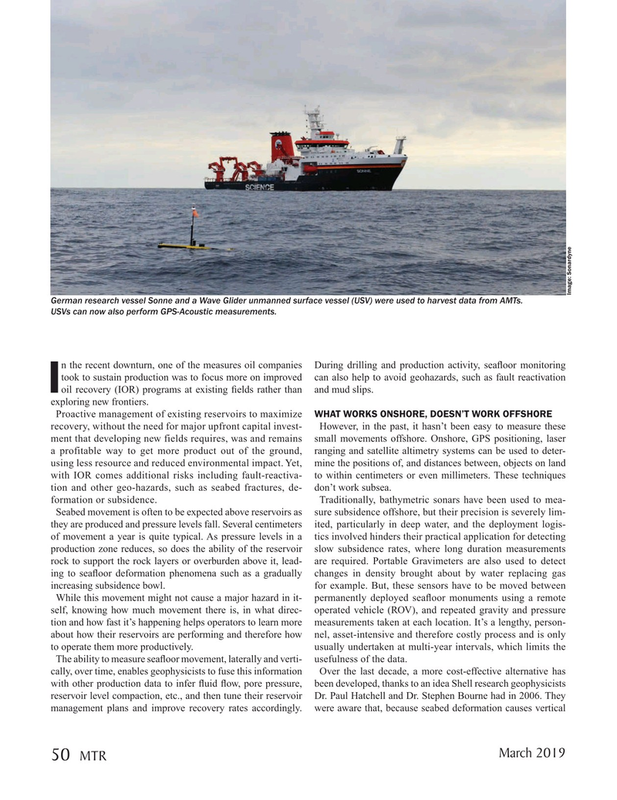 Proactive management of existing reservoirs to maximize WHAT WORKS ONSHORE, DOESN’T WORK OFFSHORE recovery, without the need for major upfront capital invest- However, in the past, it hasn’t been easy to measure these ment that developing new fields requires, was and remains small movements offshore. Onshore, GPS positioning, laser a profitable way to get more product out of the ground, ranging and satellite altimetry systems can be used to deter- using less resource and reduced environmental impact. Yet, mine the positions of, and distances between, objects on land with IOR comes additional risks including fault-reactiva- to within centimeters or even millimeters. These techniques tion and other geo-hazards, such as seabed fractures, de- don’t work subsea. The ability to measure sea? oor movement, laterally and verti- usefulness of the data.